My roses would start the season with beautiful glossy leaves. But by the middle of the season, the leaves would be downright ugly due to Rust, a fungal disease. I figured my sprinkler system was the culprit since roses do not like their foliage to remain wet. Last summer, they looked so terrible that I cut them back. Honestly, I never thought they would grow back. Although, I have been gardening for five years, most of my planting experience is through trial and error. Um, a lot of error. One day, my friend came over with her mom, a true garden maven. After looking at my roses (or what was left of them), she said “sprinkle coffee grounds around them and they will flourish.” I was desperate because my roses looked so pathetic. It couldn’t hurt? Right? I started taking hubby’s left over coffee grounds and sprinkling it around the roses and sure enough, they started to grow. I was amazed! Since hubby was my family’s only coffee drinker, I needed another source of coffee grounds to give to my other plants. Cards on the table? My addiction needed another source. What about Starbucks, I pondered. I bet they would gladly give me their grounds. When I got to the store, Starbucks must have known that gardeners love coffee grounds. Right by the door was a wastebasket with a little sign, “Grounds for your Garden.” I reached in and snatched my garden treasure. You would have thought I won the lottery. With all this happiness of my new found source of coffee grounds, I still had no idea how much to give to my rose plants. So I gave them probably more than enough to cause any human to stay up half of the night! Come to think of it, those roses seem to stand up way to straight. Lo and behold, the roses continue to flourish. Was it the coffee grounds or the weather? Or the roses were simply prospering despite my “magical” coffee grounds? Nah, it was the coffee grounds. Then I started to obsessed about my other plants. How about my hydrangeas? They were pink and they should be blue. Could the acidity in the grounds turn the hydrangeas from pink to blue? I bet. But in the back of my what was left of my logical mind, I wondered, was I giving my plants too much coffee grounds? Was I harming them? Well, I won’t spoil the answer for you even if you threaten to take the coffee grounds away from me. You’ll just have to read Coffee Grounds, Friend or Foe. Don’t forget to read how to compost your grounds too. Do you use coffee grounds for your roses? If so, did you see a change? Do you use coffee grounds for your other plants? If so, have you seen a change? I get the coffee grounds from Starbucks also. They usually go right into my compost bins. My home brewed grounds will also go in there, or I dump right into my worm compost (once cooled), they really seem to enjoy them. I don’t think your compost ground is the reason why your plants turn out like that. Yes, the weather maybe is one reason of this. I suggest if you could give a little shade, plants will not be under the direct sunlight. And water them only during morning, before sunrise. 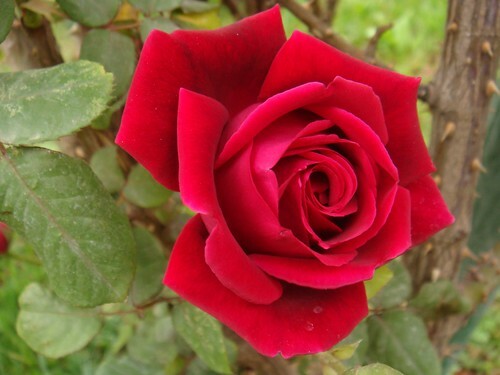 I’m in the Houston, TX area….it’s turning colder and the roses are barely blooming, at this time of year…..should I still use the coffee grinds around them, mixed with mulch? If so, how often this winter should I do it? The weather usually becomes “spring-like” in March. Thanks! I’m a new gardener and am so excited about my free coffee grinds, I’m trying to find uses for it so I don’t have to throw out the wonderful amount I got. Any suggestions on storage for the coffee grinds, would be helpful. Happy New Year! Here in Florida, my grandmother was well known for her gorgeous roses- and the envious always wanted to know what was her secret. Coffee grounds, of course. But not JUST coffee grounds. The countertop bin in HER house had the spent grounds (no filters,) eggshells (just the halves tossed in,) and the contents of her ashtrays. Yes, cigarette butts and all. She’d simply toss the uncomposted trio into her containers and voila!- envy-of-the-town roses. To be clear, though, I wouldn’t dare promote smoking (or stalking the local bars for their ashtray garbage!) Someone in the know would need to confirm my suspicion, but I imagine the analogue to the butts might be wood ash. I’m only an aspiring newbie gardener, and I don’t know what nutrients her exact trio contributed to the robust health of her roses…I just know it works. Great site, thanks. How about coffee grounds for a newly planted fig tree. My soil tested 7.1 last year so am trying coffee grounds. This should acidify the soil but how much is too much? Starbucks is a great source. Comments and suggestions? Joe, I don’t think coffee grounds will make your soil that acidic. I read figs can grow in any type of soil as long as there it a lot of organic mater. I would use compost.